Creating an API definition is the first step to configure the API in the TIBCO Mashery® Control Center. Other API related settings can be configured on the API Definition Settings, API Definition Security Settings, API Definition Error Sets, and API Definition Access Control pages. 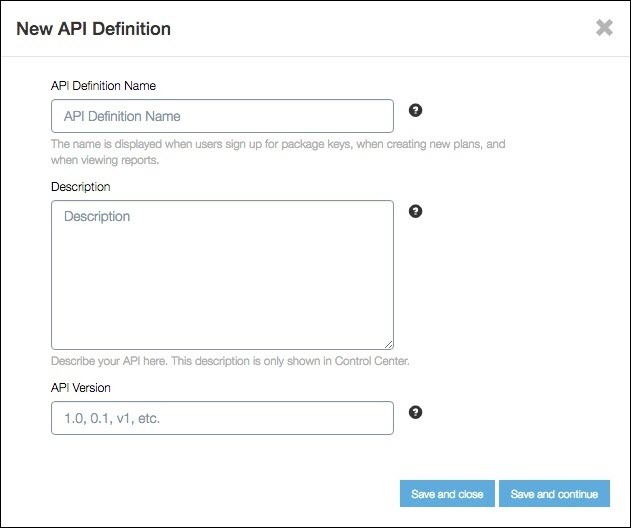 On the API Definitions page, click the New API Definition button and select the Create manually option. The New API Definition pop-up window is displayed. API name that is displayed while creating Packages and Plans, and while generating reports. API description that states the purpose of the API. API version helps to identify a particular instance of the API. This field is defined for administration purpose, and it assists in the management of multiple versions of your API. API version is a metadata that can further describe the particular API definition. Click Save and close to finish creating the new API definition, which should now show in the list of API definitions of the API Definitions page. Click Save and continue to go to the API Definition and Endpoint List page, where you can define the endpoints for the API definition. For more information, see API Definition & Endpoint List.